Rainfall will spread from southwest to northeast on Tuesday, with a limited area of freezing rain and/or snow possible Tuesday evening in far North Jersey. In Monday's weather blog post, I called this week's weather forecast "active" as a series of storm systems line up to affect New Jersey. Well, our next storm arrives Tuesday, and it's going to turn into another wet day and wet night. Rain will overspread New Jersey from southwest to northeast by around lunchtime Tuesday. Models suggest pockets of heavy rainfall are possible through the Tuesday evening commute. Even though it will be cloudy and cool, high temperatures will range from 43 to 48 degrees - well above freezing. 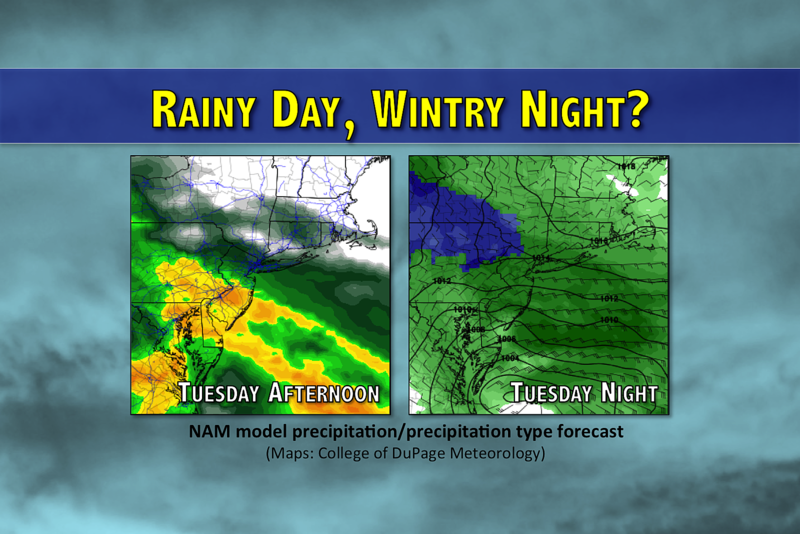 So Tuesday daytime will be wet, not wintry. However, as temperatures fall Tuesday evening and the rain continues to fall, a period of winter weather will be possible. Far northwestern New Jersey (around Sussex and Warren counties) could experience a bit of freezing rain and/or a quick inch or two of snow late Tuesday evening (around 10 p.m.) The National Weather Service has issued a Winter Weather Advisory for freezing rain and snow in Sussex County, from 4 p.m. Tuesday through 6 a.m. Wednesday. Again, this threat of wintry weather will be geographically limited, and any snow accumulations are expected to be light. This storm system will exit by Wednesday morning. Following residual showers, Wednesday will be a mostly cloudy day with quiet weather. High temperatures will bounce back to the lower 50s - a hair above normal for early December. But don't get used to the warmer 50s - the next in our series of storm system will be a cold front that will open the door to some arctic air on Thursday. In fact, it looks like the coldest air of the season (so far) is on the way for the end of the week. Thursday afternoon's high temperatures are forecast to reach the mid 40s. A few rain and snow showers will be possible on Thursday - but this is poor model agreement on this precipitation at this time. Late-day Thursday, a brisk wind will increase and temperatures will start to plummet. Even though skies will clear to sunshine on Friday, wind gusts to 40 mph will help limit high temperatures to about 40 degrees. Oh yes, you will definitely feel the cold and bluster of winter all-day Friday. Saturday won't be much better, with highs once again in the upper 30s to around 40 degrees. Winds will be a little bit lighter, at least. Our next storm system is scheduled to arrive Sunday night. It's too early for details, but I'm leaning toward an all-rain event, as this system will temporarily deliver warm air to the Garden State.